Rainwater harvesting is increasingly popular with cabin and cottage owners, conservation minded urban residents, and people who want a more natural source of water – free of chlorine and fluoride – for their garden or their family. Rainwater Harvesting Systems range from the simple – a barrel positioned beneath the downspout of your eaves trough – to the relatively complex – an underground storage tank with an electric pump and ultraviolet filter connected to your home’s plumbing. The design of your system will depend on your needs and your capacity. Whatever your needs are, and whatever your system looks like, we will provide the highest quality storage tanks and accessories. 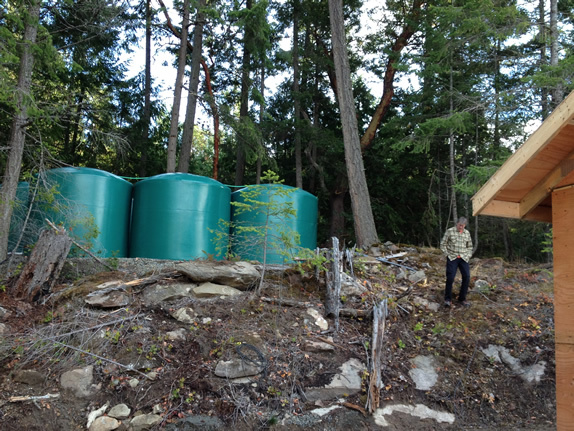 The most important part of your rainwater harvesting system is your tank. A cheap, low quality tank will crack and cause water loss, potential flooding, and allow dirt and mosquitoes into your water supply. The most important consideration before designing your rainwater harvesting system is whether you will be relying 100% on rainwater, or supplementing municipal water, a well, or another reliable source of water. High Quality Water Storage Tank Various sizes are available for all your storage needs. Gutter Screen or Basket Filter A second, finer filter is not necessary but will save you the labour of cleaning sediment out of the tank. Distributor Watering can, hose, or pump – depending on your needs. Some limitations of harvesting rain and saving water are for example the size of your roof and your average rainfall, means that you may only be able to harvest enough rainwater for outside use only, or for toilet flushing. Before you get started – especially rainwater collection for inside use – be sure to check with your municipality for applicable regulations. The most important thing to ensure is that you have a properly sized, high quality rainwater tank for all your harvesting needs.